The masseria is a 17th Century building of over 300 square meters with a large private pool of 10x6 meters. The Masseria has been tastefully furnished and offers 3 large double bedrooms and one single bedroom with a second removable single bed, but can comfortably accommodate up to 10 guests thanks to the 2 comfortable sofa beds for children. This beautiful historic farmhouse of more than 300 square meters (internally) is spread over three levels. The carefully maintained garden around the Masseria is rich in vegetation and covers about one hectare. The private pool (10x6 meters) is surrounded by lawn and furnished with high quality sun beds and umbrellas. The Masseria is completely surrounded by a perimeter wall that provides guests with maximum privacy. Additionally the property is equipped with an alarm system which is connected to a local security company. 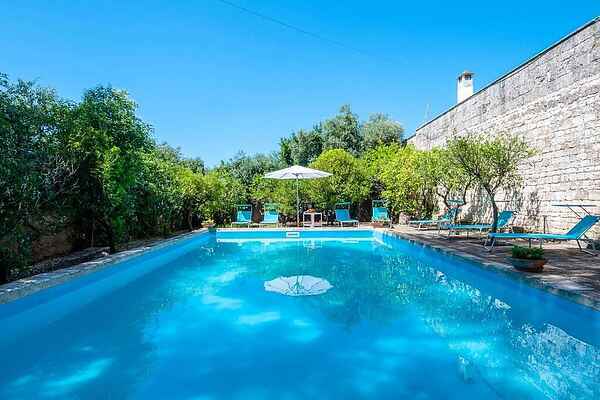 This amazing farmhouse is situated in a convenient location near the famous Trulli of Alberobello, the Castellana Caves and the beautiful beaches of Cozze and Polignano a Mare (Blue Flag Beach).